Were None of Stump’s Texts On Our List Reviewed by Cole? Were None of Stump’s Text Messages On Our List Reviewed by Judge Cole? While Judge Cole’s two-paragraph report is silent about which of Commissioner Bob Stump’s text messages he actually looked at, the former judge’s comments last Friday to the Arizona Republic indicate that he did not look at any of the more than 3,500 text messages sought by C&BP’s public records request. Only those text messages given to Cole by the Attorney General’s office were apparently reviewed. In paragraph 33 of our lawsuit, we specifically asked that the text messages exchanged with the owners of 18 phone numbers be reviewed to determine if any were public records. Cole reviewed 13,000 or more text messages from Stump’s phone. But, apparently, none were the ones we asked for. The total number of text messages that you reviewed and their date range. 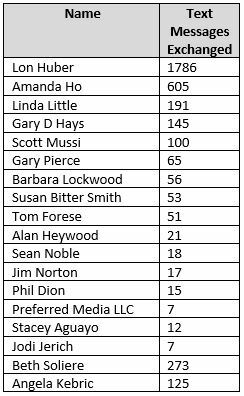 Out of the total number of text messages you reviewed, how many of those were the text messages sought by plaintiff’s public records request (the 3,598 text messages between Commissioner Stump and 18 individuals and entities between May 1, 2014 through March 11, 2015). If the answer to this question is “zero” or some small number that would greatly streamline the litigation going forward. If you did review any of the text messages sought by plaintiff, can you identify which ones by the date, time and the sending and receiving phone numbers? For any such text messages identified in response to number 3 above, can you please indicate which ones that you believe are not public records in accordance with the standard put forth by the Supreme Court in Griffis v. Pinal County? If you found that any text messages identified in response to number 3 above were a public record under the Griffis test, could you provide which reason under the Carlson v. Pima County (i.e., where an interest in privacy, confidentiality or best interest of the state overcomes the presumption of disclosure) for deciding that the text message should not be produced. Judging from Commissioner Stump’s recent statements, he really wants this to be over. But it’s not over yet. Why were the Attorney General’s investigators unable to download any of the more than 3,500 text messages that we asked to be examined? Were their systems up-to-date? Were they, for some unknown reason, held back? Or was Stump truly able to delete them, as he claims he tried? Judge Cole appears to have played the hand he was given. But it appears he was not given a full deck of cards. In the days to come, we’ll attempt to answer these mysteries.